In a slip and fall, life can change in an instant. You are walking along when something causes you to lose your balance and fall. If you are lucky, you can get up, dust yourself off and go on your way. If you are unlucky, you have seriously hurt yourself and require immediate medical attention. The fall may not have occurred due to any fault of your own. Property owners have a duty to keep their premises safe so that people are not injured, and that the property does not violate local building codes. If the property owner allows a dangerous condition to exist – such as bad lighting, broken pavement or wet floors with no signs or other warnings – and someone is hurt, they may be held liable for the person’s injuries. An experienced premises liability attorney can help. If you experience any pain from a slip and fall injury, visit a doctor as soon as possible. Women are more likely than men to slip and fall. 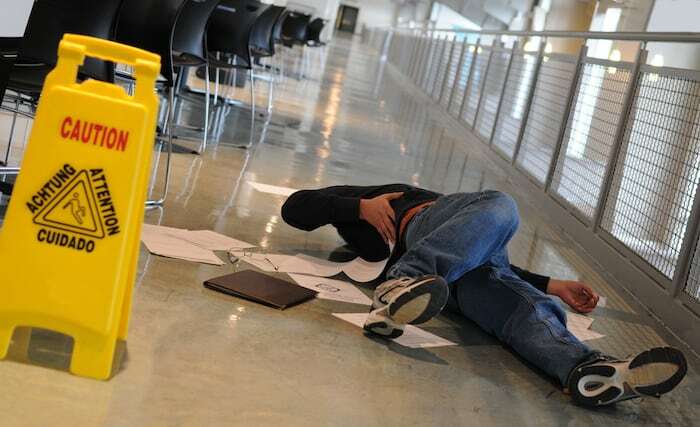 Slip and falls are the leading cause of workers’ compensation claim related injuries. Of these, the majority occur on slick floors. According to the Bureau of Labor Statistics, in 2014 slips, trips and falls accounted for 27 percent of cases involving days away from work. Slip and falls account for approximately 1 million emergency room visits annually. In falls on private, non-business property, the victim must usually be an “invitee,” or someone the property owner allows there. Trespassers cannot generally sue when illegally on the premises. In a slip and fall case, the injured party must prove there was a dangerous condition on the property that the owner should have known about and repaired. Every situation is different. If there were longstanding holes in a walkway and the owner did nothing to fix them, that’s one thing. If the injured party was talking on his or her cellphone, paying no attention to where they were going and tripped over a large planter adjacent to the walkway, that’s another. A landlord may or may not be responsible for a slip and fall occurring in a tenant’s rental unit. For example, if someone was at a party and tripped over the tenant’s coffee table, the landlord is not at fault. An attorney will let you know whether your case has merit. If you or a loved one has been injured in a slip and fall accident, contact Dashner Law Firm today for a free consultation. You may be owed compensation for your injuries. The right legal representation for a premises liability case makes a difference in both your compensation level and peace of mind.